Turmeric has been used as both a food and medicine for thousands of years. Its orange pigment is due to the curcumin content, which is also one of the primary active phytochemicals in the plant. Turmeric is a staple in Indian, and other Southeast Asian cooking, and is thought to provide adaptogenic, and general health-promoting effects in these regions. There has been a lot of study on turmeric in recent decades investigating its effects on cancer, cardiovascular disease, diabetes, inflammatory conditions, and as an antibacterial and antiviral. Turmeric has shown promise in all of these areas. The major problem with turmeric is its low bioavailability. Cooking the root for long periods of time such as with curry, or soups can improve this bioavailability in the gut but is still far less than 50% bioavailable. This is an issue when trying to use turmeric for systemic conditions, and requires a large amount of the herb to have any effect whatsoever. Combining turmeric with other herbs like black pepper (the piperine content) has shown dramatic improvements in bioavailability. What Is Turmeric Used For? Turmeric is mainly used in cooking, and as an antinflammatory agent. The potency of turmeric is bellieved to be increased after cooking, which has been shown to have some merit due to the increased biavailability after cooking for long periods of time. Turmeric is a potent antinflammatory, especially in the diegestive tract and is commonly used to treat inflammations throughout. It is especially useful for chronic inflammatory conditions like IBS, endometriosis, interstitial cystitis, and other inflammatory (and often idiopathic) conditions. It is also used as an adjunctive cancer therapy for its potent antioxidant, and antinflammatory activities. Turmeric has been used as a spice and medicine for thousands of years. It was listed in an ancient Assyrian herbal from around 600 BCE as well as by Dioscorides . In India, turmeric is used as a stomachic, tonic, to purify the blood, improve digestion, treat fevers, skin conditions, and vomiting during pregnancy. Here, it is also applied topically to treat conjunctivitis, skin infections, cancer, sprains, arthritis, hemorrhoids, reduce hair growth, promote wound healing, and treat eczema. . Its main, longstanding use, especially in Ayurveda is for its potent anti-inflammatory actions . Regulates and moves blood, regulates and moves Qi, Descends Qi, dispels wind-damp, removes blood stasis, relieves pain . Do NOT use during pregnancy. .
All forms of deficiency, especially if signs of blood or Qi stagnation are not present . Moves and regulates blood and Qi, removes blood and Qi stasis, cools heat, cools blood, drains damp-heat . Do NOT use during pregnancy . Yin deficiency after blood loss, lack of indication of blood or Qi stagnation . In traditional Chinese medicine, turmeric is used to stimulate the blood and Qi, offer analgesic properties, treat chest and abdominal pain and distention, jaundice, frozen shoulder, amenorrhoea due to blood stasis. The tuber is used similarly to the root but is used more in hot conditions. .
Turmeric comes from Southeast Asia, but is now cultivated throughout the topics. Long-term use is acceptable with this herb. A member of the Zingiberaceae family, it is closely related to ginger (Zingiber officinalis). The Zingiberaceae family contains 50 genera and 1600 species. Turmeric can grow up to 1m high. The flowers are pale yellow in colour. The rhizome has 2 parts, a primary, egg shaped primary rhizome (referred to in Chinese medicine as the tuber), and cylindrical, branched secondary rhizomes growing from the primary rhizome. .
Much of the cultivation of turmeric is in India (especially the south central states), as well as China, Taiwan, Philippines, Java, Haiti, Jamaica, and Peru [4, 7]. Turmeric essential oil is produced via steam distillation from the dried rhizome. It is yellow in color due to the curcuminoids (o.3%-5.4%). .
Curcumin is a dual inhibitor of arachidonic acid metabolism , As well as TNF induced Nf-kB . Turmeric acts as an antioxidant by reducing lipid peroxidation and priming Nrf2/ARE . Curcumin has been found effective against leukemia , prostate cancer , and various inflammatory cascades [5, 10, 11]. Turmeric contains a rich source of medicinal components. The yellow pigment especially has a wide range of well studied, and fairly well understood medicinal actions within the body. It is made up of curcuminoids which includes curcumin (diferuloylmethane), as well as demethoxylated curcumins. 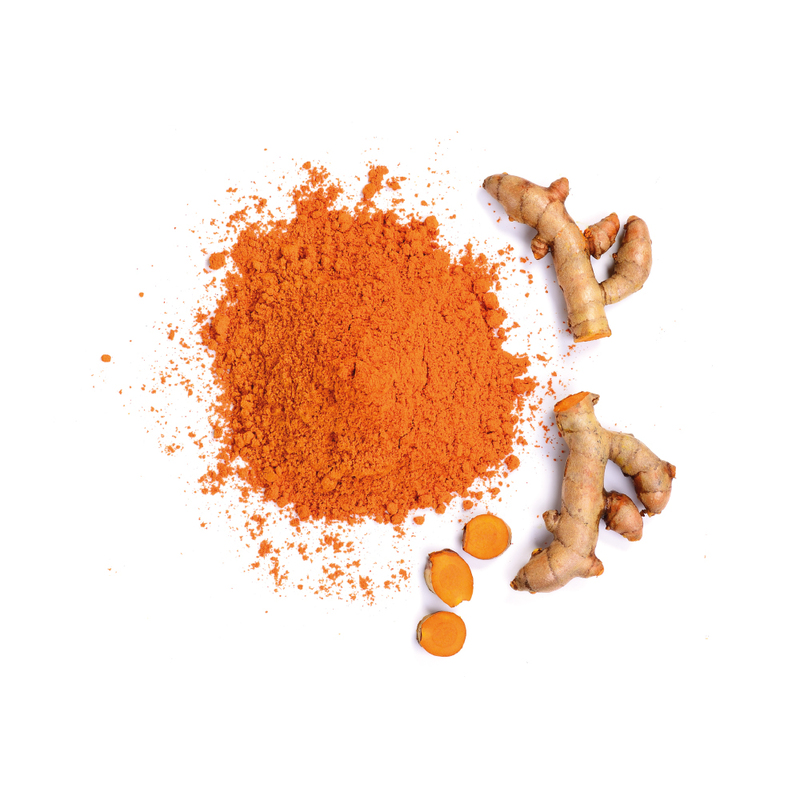 Curcumin has been shown to influence transcription factors, cytokines, growth factors, kinases, and other enzymes. This chemical has been used extensively in cancer treatment and prevention. . The essential oil also consists of tumerone (30%), turmerone (23.6%), zingiberone (25%), 1,8-cineole (1%), alpha-phellandrene (1%), sabinene (0.6%), borneol (0.5%) . Turmeric also contains an essential oil which contains: sesquiterpene ketones (65%)(includes ar-turmerone), zingiberine (25%), phellandrene, sabinene, cineole, and borneol . Synthetic Glycosyl-curcuminoids have been created and are currently being explored for medicinal applications and efficacy [1, 2, 9]. Curcumin is poorly absorbed, and rapidly metabolised where it is conjugated in the liver. It is then excreted in the feces. This means the availability of curcumin in the body is limited. . The potent antioxidant and antinflammatory activites of turmeric make it useful for treating inflammation, especally in the digestive tract, as well as throughout the body. It has shown srong potential as an adjunctive treatment for cancer and cardiovascular disease, and can be used to lower cholesterol and triglyceride levels. Turmeric is considered to be very safe, even in high doses over a long period of time. The LD50 of a petroleum ether extract taken orally is 12.2g/kg in rats. There has been a fair bit of study in the toxicity of turmeric and various extracts, all finding the same low toxicity both with high dose, and long-term tests. .
Ammon HP, Wahl MA. Pharmacology of Curcuma longa. Planta Med 1991;57:1-7. Battaglia, S. (2003). The complete guide to aromatherapy (2nd ed.). Brisbane, Australia: International Centre of Holistic Aromatherapy. Bone K, Mills S. (2013). Principles and Practice of Phytotherapy. Elsevier health. China. (Pg. 900-922). Hempen, C. H., & Fischer, T. (2009). A Materia Medica for Chinese Medicine: Plants, Minerals, and Animal Products. (Pg 536-539). Swahn, J. O. (1991). The lore of spices: Their history and uses around the world. New York: Crescent Books.